Cases in Indo-European Languages. § 1. Development of cases in Proto-Indo-European. Case is a grammar category of nominal parts of speech which expresses their syntactic relation to other words of the sentence. This definition fits well not only nouns, as primary users of cases, but also pronouns, adjectives and numerals, which can also be subject to declension - change of cases. When Proto-Indo-European was only about to become a separate language, it was probably one of branches of a larger super-family, which can be called Nostratic, Boreal or any other term. At that time, as we believe, there was no distinction between parts of speech at all, nouns, verbs, pronouns and numerals were used as single short words (there could be only two consonants in them), which were not changed. At that time the humanity did not know morphology, and only deeper social changes made it appear about seven or six thousand years before Christ. The first system of noun declension which appeared in Proto-Indo-European, was ergative. Nowadays we can still observe some ergative languages on Earth, and, for example, Basque, the majority of Caucasian languages, languages of Australian aborigines, American Indian languages are typical ergative tongues. Morphology of such languages, much more simple than classical Indo-European, uses only two cases which are opposed to each other. Ergative case functions as the subject and indirect object, absolutive case - as the subject and the direct object. The ergative stage of the Proto-Indo-European language lies too far away from our times, and practically no direct evidence of its existence can be found, so linguists still argue about its very reliability. But as the language was developing, its structure was changing from simpler to more complicated forms, and as for the most well known stage of Proto-Indo-European, it was no longer ergative, but nominative, having much more noun cases and in general quite a lot of nominal and verbal forms. The time of its existence can be pointed as about 5000 - 4000 years BC. This so-called "late" Indo-European language, which was spoken just before different branches began to appear and drift apart from the community, is well reconstructed nowadays by means of comparative linguistics. This is what we call Proto-Indo-European, and this is what is the subject of this whole site. Nominative was the case of the subject in the sentence. Usually a noun or a pronoun in nominative case opened any phrase in the language. Since then in all Indo-European languages the basic form of any noun is nominative singular; English "table", "word", "dog" are also nominative, though English nouns are not declined. Proto-Indo-European nominative singular used a special ending for masculine and neuter nouns which sounded like -s. Remember Greek oikos, Latin servus, Lithuanian namas - they all had -s to end nominative singular nouns. Feminine nouns could also have the -a ending, but many feminine nouns shared -s ending (which is called sigmatic) with masculine and neuter. Genitive was the case which denoted possessiveness of a noun, meant thet it belongs to someone or something. Genitive nouns in all Indo-European languages answer the question whose? or of what? of whom? English has preserved its possessive case (man's heart) from the Old English genitive. Genitive singular was usually ending in -s in Proto-Indo-European, though different varieties of its ending existed. One of them was -i, which was probably dialectal within the Proto-Indo-European community and then became regular in Celtic and Italic languages (Latin lupus "a wolf", lupi "of a wolf"). Genitive plural carried regularly the -n ending preceded by different formants. Dative nouns answer the question to whom? to what? Modern English does not know dative, but it is common for German, Russian, Latvian and Scottish Gaelic, and existed in all ancient Indo-European languages as well. Nouns in dative denoted the direction of action ("give to smb"), and similar meanings. Dative inflection almost always ended in a vowel or a diphthong in singular (Greek agroi, Latin agri), and was associated with -m- and -bh- (according to different theories) in plural. Accusative case is believed to have been one of the earliest in Proto-Indo-European. Together with nominative, it turned the language from ergative stage to the next, nominative one. Accusative marks the direct object in the sentence, like English "I saw my friend", "he ate dinner". The very term "accusative" means it is used to "accuse someone". Proto-Indo-European constantly represents the -m ending as a mark for the accusative case in singular number (like Latin agrum), and plural could have -ns ending which was subject to various changes practically in all languages. Then instrumental case, which as you can guess meant the instrument of action. "Go by bus", "chop with ax", "eat with fork" will be translated into Baltic and Slavic languages (where instrumental still exists) with the help of this very case. The mark for instrumental in Proto-Indo-European, as many scientists believe, included the combination -mi-, in both singular and plural, though this was not the general rule. Many late Indo-European languages lost instrumental, it sometimes was unified with dative, genitive or changed by a prepositional combination. Old English had some relics of instrumental in pronominal declension, and the word why is simply the instrumental case of the pronoun what. Ablative case was used to distinguish the action which goes from something. Typical questions of ablative are from whom? out of what? etc. Many linguists think this case was the latest to appear in Proto-Indo-European, it was not stable at all, and soon became assimilated by other cases in various Indo-European groups. The Ancient Greek language associated ablative with dative, Common Slavic - with genitive. The most probable common ending for ablative is -d stuck to the final vowel of the stem. Locative case denoted the place of action. But in fact locative was also auxiliary, not so important as nominative or genitive, and many later languages, descendants of Proto-Indo-European, did not use locative, replacing it usually with dative. Ancient Latin texts sometimes show some archaic locative forms in -i, Slavic and Baltic languages still use it, but Common Germanic and Common Celtic were already getting rid of it. It looks as if the Proto-language had -i ending for locative singular and -su or something like that in plural. And finally the vocative case, which is sometimes called "vocative form", as some people do not admit it is a real case. Vocative case was used for addressing people and had only singular number. It, probably, did not have any endings and was formed by the original noun stem without any inflections. Later vocative coincided with nominative practically everywhere in the Indo-European family. This eight-case system was highly synthetic, as the Proto-Indo-European language itself, and this kind of structure meant the highest form of inflectional development of the language. The paradigm of a noun (i.e. the number of forms a noun could have) in Proto-Indo-European reached 18 different forms, and since then this number was constantly decreasing in all groups; modern English has only 4: for example, for "table" they will be "table", "table's", "tables", "tables'". The process of analytisation began, as we may believe, about 3000 BC in Anatolian languages, then about 2000 BC in Hellenic, Italic, Germanic, Celtic, Indo-Iranian groups. § 2. Development of the case system in ancient and modern Indo-European languages. The evolution of the Indo-European original noun system can be divided into three parallel processes, some which took place in every Indo-European group. The first is dropping old cases which has been rather wide and still goes on in many languages. Many Iranian languages, for instance, dropped six of original eight cases, and replaced them with prepositional constructions. So did English, which was so ruthless even not to leave a single trace of many noun cases in itself. Practically all Germanic languages were fond of dropping cases and taking up prepositions instead (remember that in Proto-Indo-European there was no prepositions at all). The second process is coinciding cases. Two or three noun cases could unify their endings and functions in one. Ancient Greek used dative instead of dative, instrumental and locative. Latin unified locative and dative. That became possible, because languages no longer felt necessity of using so many inflections, which surely made the language much more difficult. Peoples who were conquered and had to learn an alien language did not wish to remember all endings, so they unified them: that happened to Popular Latin on Gaulish, Balkan, Hispanic lands, where all cases quickly were gathered into three or two, so modern Romance languages do not have a single example of ablative or instrumental. From the other side, those peoples which continue to use their own language without any expansions and without constant contacts with other tongues, kept their one natural - such languages are for example Baltic and East Slavic. And South Slavic tribes, mixing with plenty of different nations, lost all cases (Bulgarian and Macedonian). The third process is acquiring new cases. As for me, I thought it is impossible, and I was shocked to hear that Tocharian used to have nine or even ten noun cases. But it is possible, and can be explained by different reasons - the development of the language itself, or influence of neighbouring tongues. So dative plural was the only case which preserved the final ending from Common Celtic *-obhis, all the rest infixed the case marks. Modern Irish Gaelic language has got only two cases (three in Ulster dialect, dative included), nominative and genitive, the vocative being a special form with particle a. Scottish Gaelic still keeps relics of declension and the dative case. Manx is about to drop all distinction between noun cases. Welsh also uses the plural form of the noun with vowel interchange in the stem, but this form is gradually becoming extinct due to fast analytisation of the language. Germanic languages are even more analytic than Celtic, and this trend is going on constantly. In most of the languages the category of noun case is represented by only two of them - common and possessive, former genitive (English, Swedish, Danish, Norwegian, Dutch, Frisian). The four-case system, which existed in Common Germanic, was preserved only in German, Icelandic, Faroese, and Afrikaans formally even lacks noun cases at all, though in declension of pronouns it still shows two of them. Relations between cases are expressed frequently by word order and constructions with prepositions. Demonstrative pronouns, in addition, had even five cases in singular, though the fifth, instrumental, was probably an innovation. Middle English had three cases, but they were already going closer to each other until they finally became two which still exist in Modern English, though some limitations of usage of possessive case allow us to think that some day English will become, back like the earliest Proto-Indo-European, a language without any declension. Baltic languages are maybe the most archaic of the existing Indo-European groups. Seven Lithuanian cases continue to be widely used and do not show any signs of disappearing. Common Baltic used these seven (eight Indo-European minus ablative which coincided with genitive), but its branches were developing in different ways. Old Prussian, for instance, was much more analytic than other Baltic tongues, it lost vocative and locative and left only four cases. Besides, Old Prussian texts show clear tendency to uniting cases into one "common" case which did not appear just because in the 17th century Old Prussian became extinct. Sudovian, other West Baltic language, normally used five cases (including vocative), but some noun classes - like masculine o-stems - added locative, although it seems to have been very vulnerable. This variety is only dialectal and is unknown in the official language (see Historical Lithuanian Grammar). Finno-Ugric influence is sometimes believed to be a reason for strange peculiarities of Tocharian nouns. It had nine cases, most of which did not look like Indo-European at all, even quite agglutinative. The cases were: nominative, common indirect, genitive, instrumental, dative, ablative, locative, comitative and perlative. 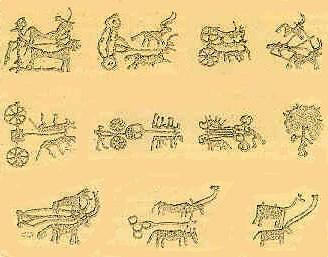 Tocharian B used also causative case and a vocative form. Comitative (conjoint or joint: "going with him"), causative (reason or cause: "doing because of him") and perlative are totally new in Indo-European declension and could be born only in Finno-Ugric surrounding, though Tocharian could generate them independently. Cases in Tocharian are agglutinative: in all other ancient Indo-European languages they are fusion. For more information on Slavic declension, see Grammar of the Common Slavic language on this site. An interesting feature was acquired by several Anatolian languages in their case system. In fact, the Anatolian branch is the least researched by linguistics, not much materials can be analyzed from quite a number of languages like Lydian, Lycian, Sidetic, Palaic. Only Hittite and Luwian are well studied, and still many things remain unclear in this branch of Indo-European languages. We should remind that Anatolian languages was the first Indo-European groups which was separated from the Proto-community and started migrating apart. That is why Hittite, Luwian and their descendants possess a number of traits which are considered archaic for Indo-European declension. For example, all Anatolian language seem to lack three-gender system: it has two genders instead, common and neuter, and this reflect the early stage of Proto-Indo-European, which made a distinction not between genders, but between animate and inanimate nouns. As for the cases, the Common Hitto-Luwian language used even nine of them. It did not lose any Proto-Indo-European ones, and constructed a new case: directive, which is unknown in any other groups. 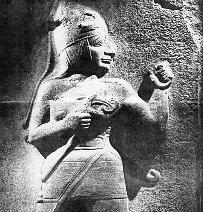 Later, when Common Hitto-Luwian was divided into Hittite, Luwian and Palaic, this directional case was associated with dative. But still its existence is beyond any doubts. Two main theories exist about this directive case. The first says that Proto-Indo-European had not eight, but nine or even more cases, but for quite a short time, and the process of generating new noun cases was replaced by the back process - eliminating of extra cases - just before the proto-language began to fall into branches. So Anatolian, being really quite archaic, had nine cases, and all other groups, which drifted apart later, had eight or even less. That is how the number of cases in the language group is attempted to be associated with the time of the group's emerging time. The second theory about Anatolian directive case is that it was born in Asia Minor as a result of some influence of substratum languages - Hatti, Hurrian or others. Taking into consideration, that in general Anatolian languages borrowed quite a lot of substratum elements in morphology and vocabulary, this version is possible enough. To conclude, we should mention also Indo-Iranian languages, which produced a great variety of noun cases and their usage. Sanskrit was the only late Indo-European language which had all eight Proto-cases, and for that Sanskrit was long thought to be the most archaic tongue of the family and the closest to Proto-Indo-European. Middle Indic, modern Indic and Iranian languages often dropped the majority of noun cases and had only two or three of them. Some of Modern Indic languages (Bengali, Gujarati, Hindi) lost completely their Indo-European inflections, developed new agglutinative system, where cases are made by case suffixes to a noun stem, and then acquired inflection back - this time the new one. Maybe this is the way all Indo-European languages will go: first ergative without cases at all, then fusion with 8 of them, later again analytic with only prepositional direction of nouns, and then again new inflection system. This going to and fro may be the case with Cases in Indo-European languages.